No Marvel comic character movie is complete without a Stan Lee cameo. Whether the film comes from Marvel Studios, Fox, or Sony, he’s there. We’ll definitely miss his presence in the series of films in the new MCU phase. But it’s a good thing that fans were blessed to see several Stan Lee cameos before he passed away. Here is a complete list of all Stan Lee cameos in all Marvel comic book character movies. One of the first Stan Lee cameos is of him playing a jury member during the Hulk trial in this television film. Matt Murdock co-stars in the story alongside Bruce Banner as his defense counsel. Stan and Lou Ferrigno play security guards in their cameo roles. Stan drinks a mix of soda and Bruce Banner’s blood. Wish we could’ve seen what happened next! In the first Spider-Man movie, he appears as a concerned citizen that protects a young girl from falling debris during Spider-Man and Green Goblin’s battle. Stan saves another lady from falling debris as Spider-Man and Doctor Octopus fight. Stan plays a random guy who tells Peter Parker, “You know? I guess one person can make a difference. Enough said”. Stan plays a clueless librarian enjoying music as Spider-Man and the Lizard fight. It’s the first time he’s not aware of what’s going on around him in a Spider-Man movie. Stan Lee is back to his senses as part of Peter Parker and Gwen Stacy’s graduation audience. He plays one of the residents in Queens in New York, who is annoyed by Spider-Man’s amateur crime-fighting antics. Stan is mistaken as Hugh Hefner in his first Iron Man cameo. Stan is mistaken the second time, this time as Larry King. Stan Lee plays a beauty pageant judge in the third Iron Man installment. Stan Lee plays a pick-up driver who tries to pull out Thor’s legendary Mjolnir using a chain tied to his vehicle. The pick-up truck driver in the first Thor movie is now a mental ward patient. Stan is Thor’s shaky-handed yet awesome barber in space! He plays a general in the audience honoring Captain America. Stan plays a security guard at the Smithsonian Institute. This is his second cameo as a security guard, the first one was in Hulk. Stan Lee is once again a delivery guy. This time he’s delivering to Tony Stark and not Reed Richards. 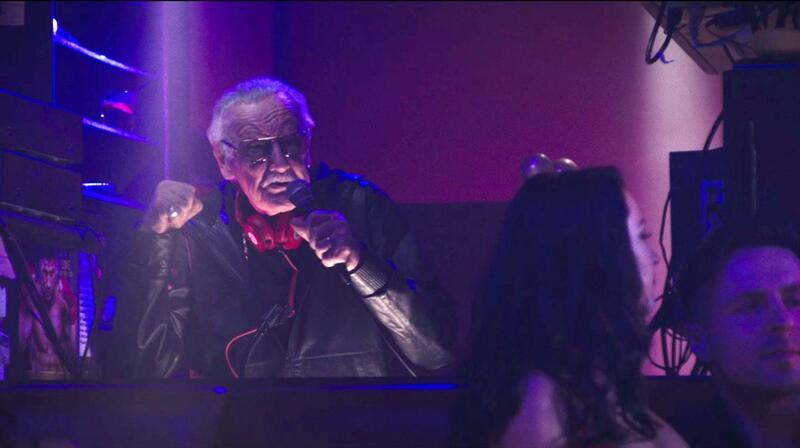 Stan cameos as a nightclub MC. This was his favorite cameo. He doesn’t appear physically but as part of a mural on a building. Stan serves drinks as the bartender in Paul Rudd’s superhero movie debut. He appears as a man whose car is zapped into a “compact car” thanks to Hope Pym’s remote. Stan Lee appears in a television news report as a chess player in a park. Stan Lee portrays another military man role, this time, as a partying war veteran. Stan cameos as a ladies’ man! As Rocket and Yondu leap frantically through space, Stan Lee appears in a spacesuit, talking to Watchers about his stint as a FedEx delivery guy (in Captain America: Civil War). Stan appears as a surprised hotdog vendor who sees Senator Kelly emerge from the seashore as a mutant. He plays a young Jean Grey’s neighbor who is surprised by her superpowers. Stan and Joanne lee cameo as an elderly couple terrified of the destruction caused by Apocalypse. Stan is Reed Richards’ postal delivery guy. He appears as an uninvited wedding guest at Reed Richards and Sue Storm’s wedding. Stan plays a London bus passenger oblivious to the chaos caused by Doctor Strange, Baron Mordo, and Kaecilius. Stan Lee appears as one of the dealers in a hidden casino. A young Matt Murdock stops an elderly man from getting hit by a bus using his walking rod. The elderly man turns out to be Stan. This is one of his most meaningful cameos ever. In this animated feature film, the father of Marvel Comics transforms into Fred’s dad. Can you guess what Stan Lee’s last ever cameo is? Comment below!